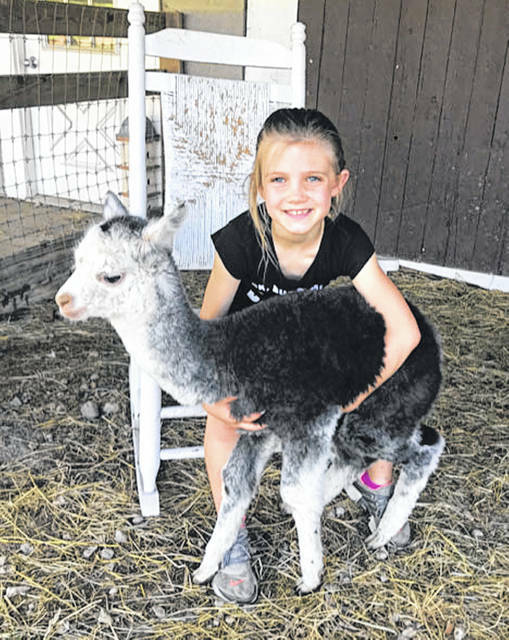 Elayna Ernst, daughter of Doug and Amanda Ernst, of Troy, holds one of the alpaca cria (baby) at Count Your Blessings Alpacas farm. She is the granddaughter of the owners, Rick and Annette Paulus. 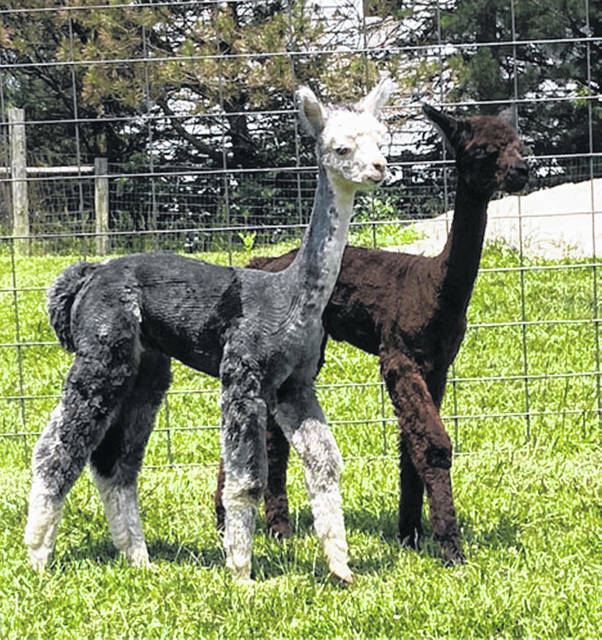 Two young crias (alpaca babies) Prince Louis (left) and Prince Harry are ready to greet visitors at Count Your Blessings Alpacas on Sept. 29. SIDNEY – Count Your Blessings Alpacas will invite the public to come to its farm to meet its alpacas and learn more about these inquisitive, unique animals, the luxury fiber they produce and why the alpaca business is perfect for environmentally conscious individuals on Sept. 29. The year 2018 marks the 12th year for Count Your Blessings Alpacas to welcome guests to join it for this free event. There will be many activities, including petting, feeding and leading alpacas, demonstrations, alpaca obstacle coarse, door prizes, hay ride or just come and relax for a while, enjoy food and refreshments and listen to the music by Timmy G. & Co. and the hummmm of the alpacas. There is no entry fee. This also is an opportunity to learn what is so special about alpaca fiber and the variety of products that people enjoy. Alpaca products will be on display and available for purchase if interested. Rick and Annette Paulus will host visitors to their farm from 11 a.m. to 4 p.m. Sept. 29. Count Your Blessings Alpacas is located at 680 Doorley Road, Sidney. Alpacas, cousins to the llama, are beautiful, intelligent animals native to the Andean Mountain range of South America, particularly Peru, Bolivia and Chile. Alpacas are considerably smaller than llamas, and unlike llamas, they were not bred to be beasts of burden, but were bred specifically for their fiber, which is used for making knitted and woven items, similar to wool. Adult alpacas stand at approximately 36 inches at the withers and generally weigh between 150 and 200 pounds. They do not have horns, hooves, claws or incisors. Alpacas are alert, intelligent, curious and predictable. They are social animals that seek companionship and communicate most commonly by softly humming. Alpacas are shorn, without harm, every 12 to 18 months. An adult alpaca might produce 5 to 8 pounds of fiber. Containing no lanolin, alpaca fiber is also naturally hypoallergenic. Most people who are sensitive to wool find that they can wear alpaca without the itching or irritation they feel from wool because alpaca fiber is smooth. Additional performance characteristics include stretch, water repellency and odor reduction. For travelers, clothing made from alpaca is desirable because it is wrinkle-resistant. Today’s consumer searches for high-quality, environmentally sound products made of naturally renewable resources. The alpaca provides fiber, just as it has for thousands of years, to create colorful garments that are soft to the touch. Classically styled alpaca sweaters and suits can last for generations. Socks, scarves, purses, golf shirts, teddy bears and blankets are just a few additional items made from North American alpaca fiber currently on the market. Alpacas come in 16 natural colors, but they are all green. Alpacas prefer to eat tender grasses, which they do not pull up by the roots. Lacking upper teeth, alpacas “cut” the grass with their bottom teeth and upper palate. This vegetation cutting encourages the plants’ growth. Because they are modified ruminants with a three-compartment stomach, alpacas convert grass and hay to energy very efficiently and stop eating when they are full, further preserving the landscape on which they live. However, alpacas do not mind eating brush, fallen leaves, and other “undesirable” vegetation, leaving the “good stuff” for species that do not have the stomach to digest such roughage. Alpacas’ pellet-like droppings are PH balanced and an excellent, natural, slow release, low odor fertilizer. This rich fertilizer is perfect for growing fruits and vegetables. Because alpacas consolidate their feces in one or two communal spots in the pasture, it is easy to collect and compost, and the spread of parasites is controlled. While alpacas are environmentally friendly … and even beneficial… to the land, what makes them even more “green” is the fiber they produce. No chemicals are employed either during feeding or during the industrial production of alpaca fleece into fiber. If dying is desired, only 20 percent of a normal dye quantity is required. All fiber from an alpaca can be used. Even the fiber from the lower legs, belly, neck, etc., is being used for things such as natural weed mats to be placed around trees and in gardens. Alpaca fiber is biodegradable. All alpacas are capable of spitting, but it is almost always reserved for other alpacas, not humans. Alpacas are very vocal and make many sounds to communicate their feelings. The most common is a humming sound to let the others know that they are present and calm. To learn more about Count Your Blessings Alpacas, call 937-538-0308 or find “Count Your Blessings Farm” on Facebook.